The 10th anniversary edition of The Graveyard Book includes a foreword by Margaret Atwood as well as sketches from the illustrator, handwritten drafts, and Neil Gaiman’s Newbery acceptance speech. 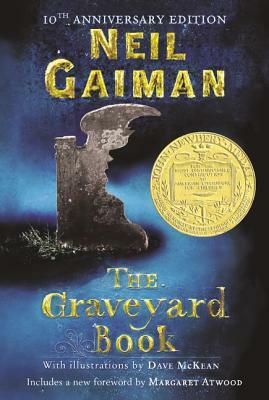 The Graveyard Book, a modern classic, is the only work ever to win both the Newbery (US) and Carnegie (UK) medals. Dave McKean is best known for his work on Neil Gaiman's Sandman series of graphic novels and for his CD covers for musicians from Tori Amos to Alice Cooper. He also illustrated Neil Gaiman's picture books The Day I Swapped My Dad for Two Goldfish, The Wolves in the Walls, and Crazy Hair. He is a cult figure in the comic book world, and is also a photographer.